Below are the official 2018 Hockomock League Girls Basketball All Stars, selected by the coaches in the league. SPRINGFIELD, Mass. – The calendar hadn’t yet turned to 2018 yet, but Foxboro head coach Lisa Downs something in her team that made her believe there was something special about this group. The Warriors trailed by four with less than a minute to play in their second meeting against highly touted Coyle & Cassidy. Senior Ashley Sampson had a steal and a bucket to get within two. After Coyle missed the front end of a one-and-one, senior Lily Sykes drained the go-ahead three with 10 seconds left in the game to give the Warriors a dramatic win. That comeback told Downs everything she needed to know about her team, and how far her seniors could take the team. 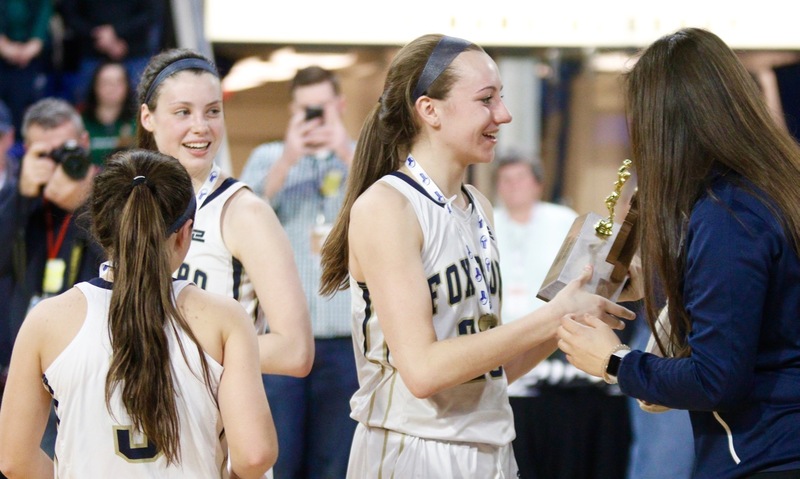 Downs saw the same look in her players eyes on Saturday morning as they rallied from a 10-point halftime deficit, winning the Division 2 State Championship with a 49-41 win over Hopkinton. Sykes, Sampson and fellow senior Grace Tamulionis spearheaded the comeback. The trio have been making plays for the Warriors since their freshman year, so it’s only fitting they led the way in the state final. Tamulionis got hot from three in the final quarter, hitting one early to cut the deficit to 31-29, and then draining another to cut Hopkinton’s six-point lead to three (35-32). Sampson then kept the Warriors in it with some strong takes of her own, coming away with a steal for an easy layup to make it a one point game. When Hopkinton answered on the other end, Sampson drew a foul on a layup and sank both free throws to keep Foxboro within striking distance. Then it was Sykes turn, sniffing out an inbounds pass to prevent Hopkinton from building its lead. And although Foxboro didn’t score off the steal, the defense continued its strong play and got a big stop. On the other end, Sykes beat her defender and took it strong for a scoop layup. That bucket gave Foxboro a 38-37 lead with 3:44 to go, their first since leading 2-0 to start the game, and a lead they wouldn’t relinquish the rest of the way. It marked the second straight game the Warriors had to overcome a double digit deficit. Foxboro rallied from as much as 20-points down in the second half in the state semifinal against Pentucket. Sampson finished with a team-high 15 points while both Sykes and Tamulionis had 11 points apiece. After Sykes put the Warriors ahead, freshman Katelyn Mollica drove hard to the basket for a key layup to make it a three-point game. Sykes came up with another steal, leading to two free throws from Sampson to make it 42-37. After another stop, Sampson returned to hit two more free throws and a 44-37 lead with a minute to go. Foxboro finishes the season 26-2. “It’s bittersweet because I’ll never have another group like this one, they are one of a kind,” Downs said. SPRINGFIELD, Mass. – Foxboro just couldn’t make it easy. After storming back from 20 points down in the second half to win a dramatic state semifinal in overtime against Pentucket, the Warriors found themselves down by 14 points to Hopkinton in the first half, having scored just nine points, in Saturday morning’s Div. 2 state championship at the MassMutual Center in Springfield. “I think they were feeling a little confident, more than they should’ve coming into the game and then they recognized the fact and were reminded of the fact that that’s a very good team,” said Foxboro coach Lisa Downs. Just as it did in the semifinal, the Foxboro defense turned the game around in the second half. After allowing Hopkinton seniors Ivy Gogolin (13 points) and Regan Keavany (six points) to score 19 combined in the first half, the Warriors held the pair to only five after the break. Behind a lockdown defense, Foxboro (26-2) used a 32-14 second half run to pull out a 49-41 victory and seal the program’s second state championship, and first since 1995. 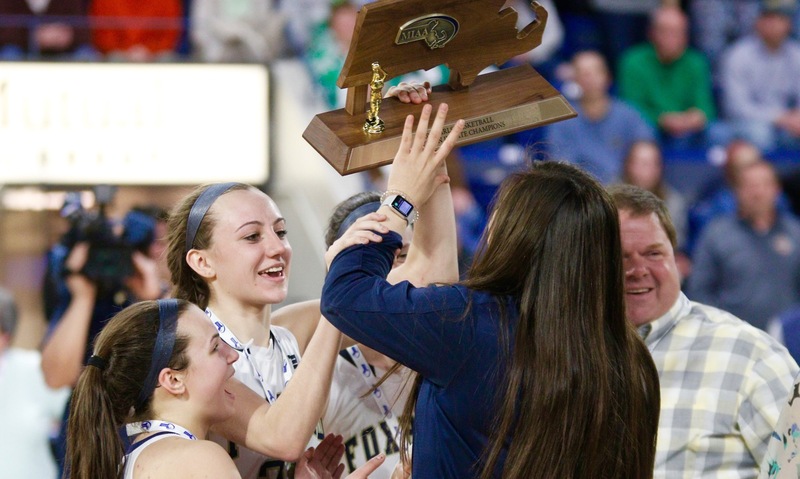 For Sampson, Sykes, and fellow seniors Grace Tamulionis and Shannon Smally, the state title was the culmination of their four years together at Foxboro. From playing together as freshmen in a South final to winning back-to-back Davenport division and Div. 2 South titles to getting redemption for last year’s loss at the TD Garden and reaching the title game, going on the journey together made the result that much sweeter. The ultimate happy ending did not look promising in the first quarter. Foxboro managed just four points, on an Abby Hassman jumper to start the game and a Sampson jumper that cut the lead to 8-4. Hopkinton was hardly lighting up the scoreboard, but all four made field goals were threes (two by Keavany) for an early 12-4 lead after one. In the second, the Hillers got the ball into the hands of Gogolin and the UNH-bound senior provided Hopkinton’s first 13 points in the quarter. The Hillers pushed the lead to 23-9 as Foxboro continued to struggle to find the range. Sykes (11 points) buried a three and Sampson followed with a pull-up jumper before Katelyn Mollica (eight points) got her first points on a tough finish at the rim. With an 8-4 run, Foxboro got the lead down to 10 at the half and, just as they had done three days before, the Warriors refused to panic. Downs remarked, “Even if I had a shred of doubt in my mind, I was completely moved when I saw their eyes. There was a timeout and I just looked at each of them and they were just like, coach we’ve got this. The Warriors got going at the start of the second half. Sykes nailed her second three to start the third, Sampson hit a pair at the line, and Tamulionis finished a fast break off a Sykes assist. Sykes grabbed a steal and a layup to cut the lead to just one. “Defense is always our thing because you can have an off-night shooting but the only time you’re going to have an off-night on defense if your effort isn’t there and my girls are always giving 100 percent,” said Downs. Hopkinton scored the final four points of the quarter to extend the lead to five heading to the fourth, but the Warriors had stolen the momentum. Tamulionis hit a pair of threes early in the fourth that kept Foxboro within three points. Sampson twice got the Warriors within one, once on a steal and layup and then on a pair of free throws. Sykes got another steal in the backcourt and went in for a layup that gave Foxboro a 38-37 lead, its first since the opening basket. Mollica scored with a drive to the rim and Sampson became more aggressive taking the ball to the basket and getting to the line. She went 7-of-9 down the stretch and Mollica added four from the charity stripe as well. The seniors have played 99 games together during their high school careers. It has been a long journey to this moment and it was one that each of them wanted to savor. Sykes said, “It’s the best feeling ever. They’re my best friends off the court and to win this with them is huge. Downs, who was an assistant coach in 1995, the last time that the Warriors won the state title, praised her seniors for their contributions to the program and admitted that along with the excitement of winning is the sadness of not having another practice or game with this group. “It’s kind of surreal,” she explained. “It was 111 days ago, I counted on the calendar, that we started the season and we knew we had to put some tough games on our schedule because no one else would play us this year. Following a thrilling comeback win in the state semifinal, Foxboro is headed to Springfield for the MIAA Division 2 State Championship. The Warriors will take on a familiar foe in Hopkinton. Foxboro played the Hillers twice this season and split the season series. HockomockSports.com’s Josh Perry and Ryan Lanigan discuss Foxboro’s season and the upcoming game against Hopkinton. Guests on the podcast include Foxboro head coach Lisa Downs, Boston Herald correspondent Greg Dudek, and Canton head coach Jimmy Choquette. WOBURN, Mass. -As the clock was winding down in overtime, Foxboro coach Lisa Downs stood with her hands behind her head at the end of the Warriors bench. Her face filled with happy disbelief, as though she couldn’t believe what she was seeing from her team. She was not alone. 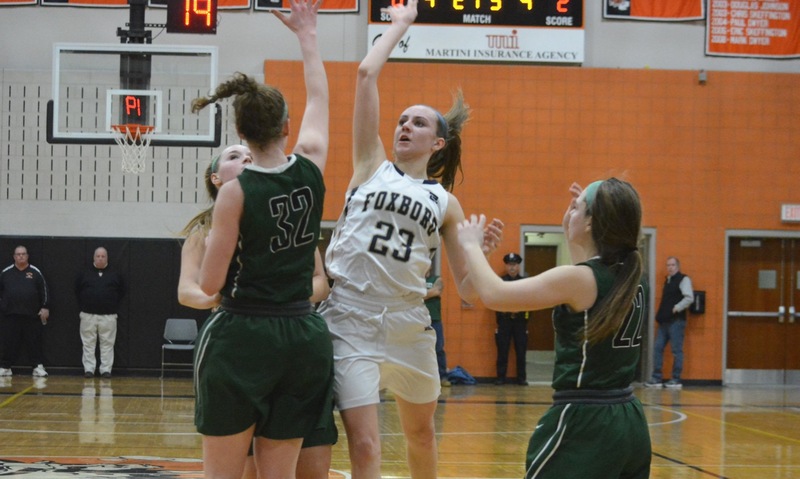 Foxboro had fallen behind by as many as 20 points in the second half, struggling to stop North champion Pentucket from getting to the basket on one end and struggling to get anything to go down on the other end of the floor. It looked as though, for the second straight year, the Warriors would end their season in the state semifinal. But something changed in the third quarter. Foxboro switched to an aggressive 2-3 zone that took away the driving lanes and seemed to lift the team’s energy level and a couple of shots started to fall. The lead was cut down to 10 at the end of three and momentum was with the South champs heading to the final eight minutes at Woburn High. That was when the senior leadership took over. 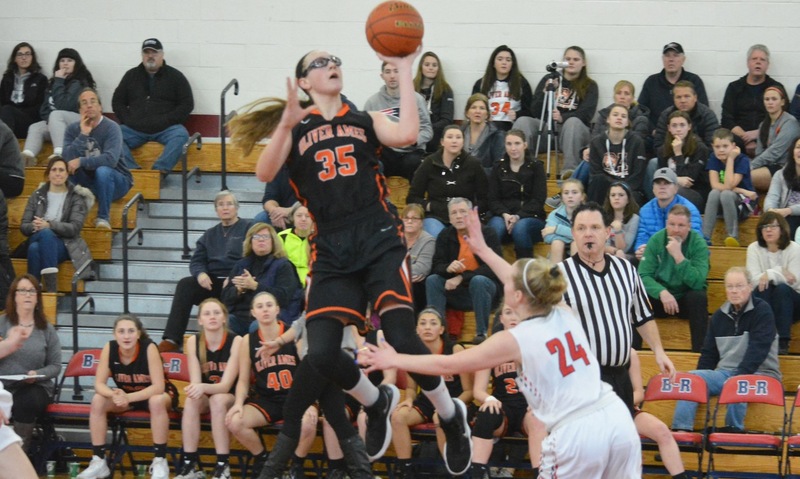 Lily Sykes buried three shots from beyond the arc and Ashley Sampson put together the type of run that made her a Hockomock League MVP as a junior. After being held to just two points in the first three quarters, she scored 20 in the fourth quarter and overtime, including 19 of her team’s final 20 points, and made a driving layup on the left baseline to tie the game with 2.6 remaining in regulation. Sampson would go on to score 14 points in overtime, shooting 6-for-6 at the line in the final minute, leading the Warriors to an improbable, thrilling, 58-54 come from behind victory and a spot in the state championship game on Saturday morning. Coming off an atypical South final in which the Warriors were held to a season-low 40 points by Nauset, the scoring slump continued in the first half on Wednesday. Abby Hassman started the game with a three and had five in the first quarter, but Foxboro only managed seven as a team. The Warriors were outscored by Pentucket sophomore Casey Hunt, who had 10 by herself. The second quarter was little better, as the Sachems continued to find holes in the heart of the Warriors defense, driving to the basket and using that penetration to open space for shooters at that the three-point line. Sophomore Angelica Hurley scored eight of Pentucket’s 17 in the quarter, while Sykes (16 points and seven rebounds) scored all seven for the Warriors. Trailing 29-14 going into the break, Downs implored her team to not let this season, which included a perfect 16-0 record in the league and only two losses overall, be ended in this fashion. Pentucket did not back down to start the second half, scoring the first five points to build its largest lead, but there were signs of life from the Warriors. Freshman Katelyn Mollica (eight points) drilled a three to cut the lead to 17. After Hunt scored on a put-back, Tamulionis (five points) knocked down a pair of jumpers. Hunt responded with a drive to the basket for a 38-21 lead. Foxboro would outscore the Sachems 22-5 from that point on. Much of the change in momentum could be traced back to a defensive switch in the second half from man-to-man to a 2-3 zone that allowed Sykes and Mollica to be aggressive on the Pentucket perimeter players. Hassman kicked it out to Mollica for a three to get the run started and Sampson finally got on the board with a jumper. Hassman (seven points and seven rebounds) took the ball to the hole and scored off glass to make it a 10-point game heading to the fourth quarter. The energy seemed to be with the Foxboro bench and fans, as though they could sense there was more to come. Tamulionis fought for a tough offensive rebound and swung a pass out to Sykes for her third three-pointer of the game to cut the lead to single digits. After a Pentucket basket and a Sampson free throw, Sykes knocked down a step-back three and then buried another, after a Sampson offensive rebound, to get Foxboro within just two points. Now the Warriors were firing on all cylinders and the crowd was roaring them on. Tamulionis had two chances to give Foxboro the lead and both shots were halfway down but kicked out and Sykes had a steal and fast break for the tie, only to have the layup roll off the rim. Hurley (15 points) made them pay with a three that restored a five-point lead and a momentary respite. Sampson answered, scoring on a drive plus the foul with a minute remaining on the clock. Again Foxboro had chances to tie or take the lead but couldn’t get that crucial bucket. After two missed shots with 11 seconds to play, Sykes saved a Foxboro possession by diving on the floor to force a jump ball. The ball swung around to Hassman in the corner who took a dribble towards the top and then flipped it back to Sampson on the baseline. She took one dribble to the rim and scored to make it 43-43. The officials put 2.6 on the clock and Pentucket got a shot off but it hit the backboard and bounced away. In overtime, Sampson took over. She hit a three from the right wing to give Foxboro the lead and then made it 49-45 with another three on the left. She responded to a Sachems basket with one of her own and then was perfect at the line in the final minute. In the process, she became just the third Foxboro player to pass the 1,500-point mark for her career (Jennifer Brown was the last in 1998). Foxboro (25-2) will face Central champion Hopkinton for the third time this season on Saturday at 11 a.m. at the MassMutual Center in Springfield. The teams split two games in the regular season. TAUNTON, Mass. – Foxboro came into Saturday evening’s Div. 2 South final against Nauset at Taunton High averaging more than 65 points per game this season, but what turned out to be even more important for the Warriors as they aimed for a second straight sectional title was that their defense was allowing fewer than 37 points per game. It was not a pretty game. Neither team shot well and the game was played more at the pace that Nauset preferred, which was in the half-court, running down the shot clock and not allowing Foxboro to get into transition. Yet, at the end, Foxboro was once again heading to the TD Garden with another trophy in the case following a 40-23 victory, in which it allowed Nauset only six made field goals in the entire game. Nauset had only two seniors on its roster coming in, while Foxboro, even with senior center Shannon Smally sidelined with a shoulder injury, started three seniors and four players with experience on this stage. Foxboro used that experience to not panic even as its shots were not falling. Things started well for the Warriors, who jumped out to a fairly typical 13-1 lead in the opening quarter. Ashley Sampson (game-high 17 points and six steals) knocked down a pair of threes to get things going and then completed a three-point play to give Foxboro the early advantage. Freshman Katelyn Mollica, the lone starter who is experiencing the playoffs for the first time, also drilled a three. Nauset’s lone basket of the first was a three by 6-foot sophomore center Skyeler Sandison that made it 13-4. Abby Hassman hit a jumper off one of Sykes’ five assists to give Foxboro a 15-5 edge after one quarter. 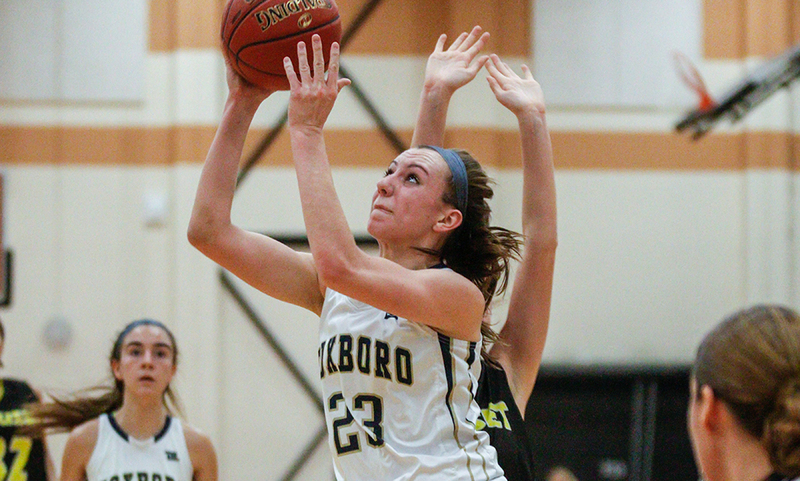 Sandison was the primary threat for Nauset coming in and Foxboro relied on Grace Tamulionis to front the center and deny passes into the post. The strategy worked perfectly. Even when Tamulionis was not able to deflect the pass, a Foxboro player was lying in wait on the backside to get the steal. Sandison finished with only five points and even though Tamulionis only scored four herself, after leading the Warriors with 19 in the semifinal, she was a key to the win. The offense started to sputter in the second. After Chelsea Gibbons hit a pair at the line, she picked up a steal and fed Sampson for a rare fast break bucket. Mollica (13 points) added a steal and layup to push the lead to 13, but Nauset would answer with five straight to give the fans who made the trip up from the Cape a little hope. Sampson took the momentum back with a floater and a transition basket off a Gibbons assist. It was 25-13 at the break even with Foxboro admittedly not playing at the top of its game. The third quarter was even worse, as the two teams combined for 11 points. Nauset got four, including a three-pointer, from Reagan Meehan, but Mollica drained a three as well, Tamulionis hit a free throw line jumper, and Sampson scored with an offensive rebound. That was all the scoring for the third. Tamulionis scored with a layup off a Sampson assist to get the fourth quarter started and push the lead to 17 at 34-17. Meehan (eight points) completed a three-point play to give Nauset some life, but Mollica knocked down a corner three and added two more with a steal and layup to seal the victory. It does not matter if the win was pretty or not, Foxboro still gets to take home the trophy for the second straight year and gets another shot at playing at the TD Garden. It is something that the Warriors have been thinking about for a full year. Foxboro (24-2) advances to face North champion Pentucket at the TD Garden on Tuesday at 5:45. BRIDGEWATER, Mass. — For the first time all season, the Foxboro High girls basketball team had to deal with a change to its lineup. After senior Shannon Smally suffered an injury in the Warriors’ win over Stoughton in the quarterfinals, the Warriors had to make an adjustment in the semifinal matchup against #5 Silver Lake. Head coach Lisa Downs inserted freshman Katelyn Mollica into the lineup, and after a close first quarter, the Warriors pulled away from the Lakers over the final three quarters to pick up a 63-37 win. With the win, Foxboro returns to the D2 South Sectional Final for the second straight year. It was a rapid start to the games the Warriors, who are known for their ability to get out in transition and score in bunches, found themselves squaring off with a team that played at the same pace. Silver Lake’s Annabella Boudreau hit her first two threes of the game to give the Lakers their lone lead (6-3) but Foxboro received trifectas from senior Grace Tamulionis (19 points, seven rebounds) and Mollica (16 points, four assists) to keep pace. The Warriors finished the first with an 11-4 run over the final 4:33 to play, getting buckets from Ashley Sampson (eight points, six rebounds, three assists), a jumper from Chelsea Gibbons and another three from each Tamulionis and Mollica. The confidence from the successful shooting over the final four minutes carried into the second quarter, and the offense continued to roll. The Lakers cut the deficit to five but Tamulionis answered with her third triple of the game off a pass from Mollica, then Abby Hassman matched a jumper from Silver Lake’s Holly Reeder-Morning. Mollica found Tamulionis once again behind the line and she drained her fourth three to make it 25-14 with under four minutes to go in the first half. Silver Lake kept it close with a 5-1 run only for Lily Sykes (seven points, five rebounds, four assists) to answer with a triple. Foxboro amped up its defensive pressure to end the half with a steal from Sampson leading to two from Tamulionis, and then a steal from Hassman resulting in a triple from Mollica, giving Foxboro a 36-22 edge at the break. The Warriors pesky defense came alive in the third quarter, holding the Lakers to just 4-for-17 shooting from the floor in the third quarter while forcing four turnovers. Foxboro used a 12-2 surge to start the quarter, pulling away from the Lakers for good. Tamulionis drained another three to start the second half followed by two each from Mollica, Tamulionis, and Hassman. Mollica connected for a three on a feed from Hassman to cap the run. Foxboro finished with 11 three-pointers on 27 attempts. Tamulionis led the way with five threes made while Mollica had four. The Warriors held the Lakers to just seven points in the final quarter, limiting Silver Lake to just 15 point total in the second half. Foxboro girls basketball (23-2) returns to the D2 South Final and will take on #3 Nauset on Saturday at 5:30 at Taunton High. Nauset has averaged 50.6 points per game so far in the tournament while allowing 37 points with wins over NDA, Duxbury, and Pembroke. #1 Franklin, 68 vs. #5 Natick, 54 – Final – Click here for a recap of this game. #4 Foxboro, 57 vs. #5 Hanover, 58 – Final – Click here for a recap of this game. #5 Oliver Ames, 53 @ #4 Bridgewater-Raynham, 61 – Final – Click here for a Recap and Photo Gallery from this game. #8 Stoughton, 38 @ #1 Foxboro, 75 – Final – Foxboro allowed just four points in the first quarter, and then used a 15-0 run late in the first half to turn a single-digit lead into a comfortable one. Foxboro senior Ashley Sampson and freshman Katelyn Mollica each scored 22 points while senior Lily Sykes added 13 points and five rebounds. Stoughton senior Val Whalen had 13 rebounds to go along with six points while sophomore Aliyah Wright added 10 points. #2 Canton, 4 vs. #18 Walpole (@ Canton), 1 – Final – Click here for a Recap and Photo Gallery from this game. #13 Taunton, 4 vs. #5 Nauset, 3 – Final (OT) – Taunton senior Will Walsh scored the game-winner in overtime, his second tally of the game, to help the Tigers score a big upset and book a trip to the D2 South Semifinals. Walsh skated down the left side, got around his defenseman on the backhand, skated to the bottom of the circle and fired a wrist shot five-hole for the winner. After going up 1-0 after the first period, the Tigers had to come back from a pair of deficits. Trailing 2-1 just a minute into the third, Taunton tied the game with 12:50 to play. Nauset took a 3-2 lead with 8:19 to play but once again, Taunton tied the game with 3:30 left. Walsh added two assists along with his two goals while Cam Sneyd (assist) and Jack Patneaude each scored once. Sophomore Sean Bunker made 27 saves in net for the win. Stoughton, 61 @ Waltham, 71 – Final – Stoughton scored 42 points in the second half and outscored the host Hawks over the last two quarters but the Black Knights couldn’t overcome a slow first half. The Knights shot just 25% from the floor in the opening half, falling behind 37-19 at the break. Stoughton hit five threes in the second half to help close the gap. Senior Cam Andrews had a game-high 21 points and 13 rebounds while classmate Colin Sanda had eight points, six rebounds, and five assists. Both Andrews and Sanda were named to the all-tournament team. Canton, 65 @ Weymouth, 59 – Final (OT) – Click here for a Recap from this game. 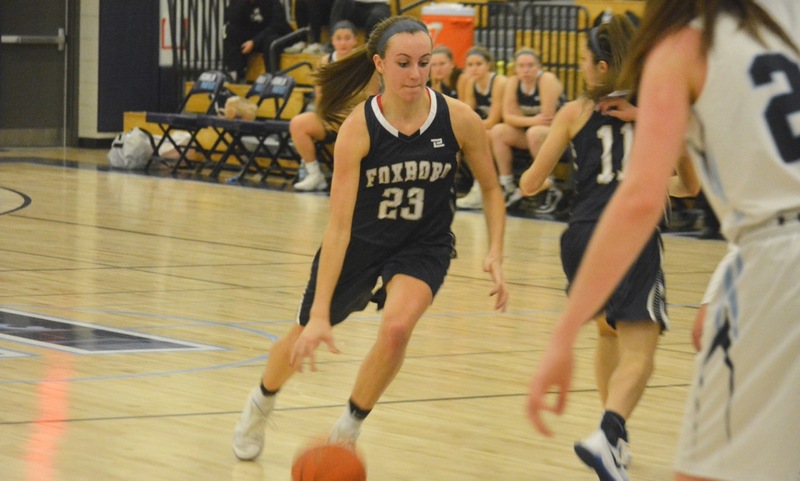 Foxboro, 58 vs. Natick, 45 – Final – Ashley Sampson scored 27 points and Foxboro closed out the regular season by winning the Warrior Classic and sewing up the top seed in Div. 2 South. Sampson was named the tournament MVP after a 29-point performance on Monday and Lily Sykes was named to the all-tournament team. 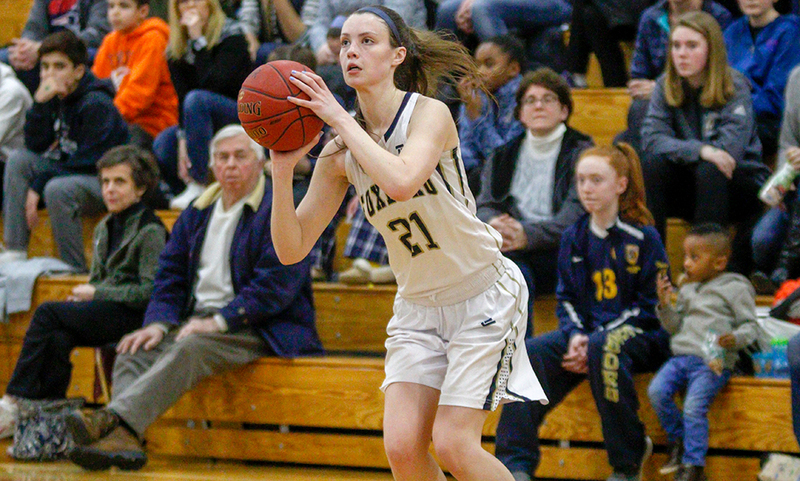 Franklin, 52 vs. Shepherd Hill, 43 – Final – Ali Brigham and Bea Bondhus combined for 31 points to help the Panthers beat the top seed at the Westboro tournament and one of the top seeds in the Central. Franklin will face Hopkinton in the tournament final on Thursday night. Oliver Ames, 77 vs Duxbury, 74 – Final (2 OT) – Oliver Ames sophomore Meg Holleran hit a pair of late three-pointers to help the Tigers edge the Dragons in the Norwell Invitational. “Key combinations of grit and determination earned the win,” said OA head coach Laney Clement-Holbrook. Senior Kayla Raymond had a team-high 22 points and 12 rebounds while classmate Abby Reardon had 12 points, including some key free throws down the stretch. Alex Sheldon added nine points and eight rebounds for the Tigers. Canton, 2 vs. Medfield, 0 – Final – Canton senior Bubba McNeice scored in the first period and junior Ryan Nolte scored in the second to give the Bulldogs a win in the first round of the Joe Quinn Memorial Tournament. Quinn Gibbs recorded the shutout in net. Canton advances to the finals and will take on host Coyle & Cassidy on Thursday at 7:30. Oliver Ames, 6 vs. Sandwich, 0 – Final – Max Ward recorded a hat trick to lead the Tigers to a big win in the consolation game of the Jeff Hayes Memorial Tournament. Colin Bourne and Brett Williams each scored once in the first period while senior Adam Healy scored in the second. Rory Madden had two assists while sophomore Owen Connor made 16 saves to earn the shutout. Taunton, 8 @ Stoughton, 3 – Final – Taunton senior Will Walsh recorded a hat trick to pace the Tigers past the Black Knights at Asiaf Arena.